I was most impressed that there was no chemical, plastic-y smell at all when unwrapped/unrolled the rug. After a couple of days it laid flat, no problem. Is softer than I expected which is a win. There's no backing but I'm using under a dining table so not a big deal. 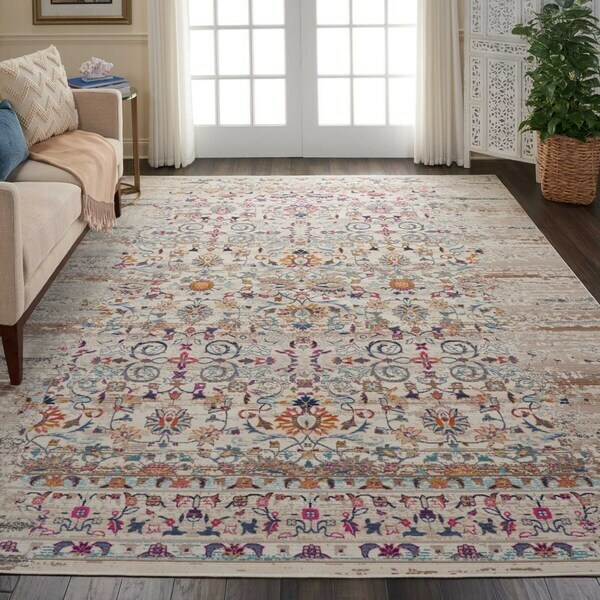 Nourison Vintage Kashan Ivory Area Rug - 5'3" x 7'10"
Gabie Ivory Transitional Area Rug - 7'6" x 9'6"
Nourison Vintage Kashan Ivory Area Rug - 8'10" x 11'10"
Love! Photo is accurate - colors may be a little more muted in person but really lovely rug. Perfect rug for my guest room. It is low pile so you may want to pick something else if you are looking for plush. I needed something low so it worked out great for me. Beautiful rug! Good quality and perfect for our dining room. Love all the colors and the vintage look. It flattens out very nicely and quickly. I love that the rug looked exactly as it was pictured on the website. My husband even commented about how nice it felt. 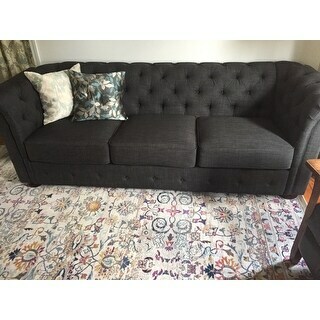 It arrive within a week and is perfect for the space I bought it for. I have gotten many compliments on it. This rug is very pretty and the colors are nice but it is extremely thin, not much thicker than a piece of felt. Also the measurements were off. It was about two inches shorter than the stated length and two inches wider. Nourison Vintage Kashan Grey Bohemian Area Rug - 8'10" x 11'10"
Nourison Vintage Kashan Ivory/Multicolor Moroccan Area Rug - 7'10" x 9'10"
Nourison Vintage Kashan Grey Bohemian Area Rug - 7'10" x 9'10"